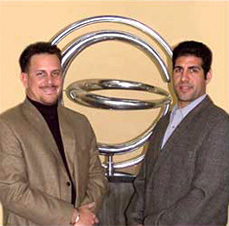 Founders of Global Domains International, Inc.
We think it's important for you guys to get to know US and we realize that we've been so buried in work behind the scenes that many of you have not even had the chance to hear from us yet. If your web browser is not capable of playing flash files, you can download the MP3 source of this interview here. *Interview conducted in 2004 and may contain information that has since been updated. We'll Answer All of These Questions and More — LISTEN NOW! What is the business background of Michael Starr and Alan Ezeir? Why did GDI launch a network marketing division? How did you arrive at the marketing model GDI is using? How long did it take to make the flash movie GDI uses? What led us to believe there would be explosive growth in the domain name industry? How is a .WS domain name different than a .com? Why we believe GDI will be the biggest network marketing company in the world. How many affiliates could we maintain with our current infrastructure? Do we plan on making the GDI opportunity available in other languages? Is it really possible to make a good living with such a low cost opportunity? Copyright © by Global Domains International, Inc. All Rights Reserved.